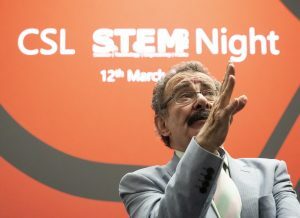 World-leading scientist, Professor Robert Winston inspired an audience of more than 200 people at Llandaff Cathedral School’s inaugural STEM (Science, Technology, Engineering & Mathematics) Society Night recently. Hosted at Cardiff University, the event, organised solely by Cathedral School Sixth Form students also included insights into life on Mars from NASA Mission Scientist, Dr Anna Horleston and why glaciers are vanishing from scientist and adventurer, Huw James. Exploring the question ‘Can Science make you happy?’, Professor Winston examined the role of hormone studies, brain imaging, research into child development and social science research to see how science might help us to understand happiness. Highlighting music as an extraordinary expression of human emotion and the art form closest to science, Professor Winston also shared the importance of laughter, especially laughing together. Clare Sherwood, Head of the Cathedral School said: “The initiative and leadership shown by our students is exceptional. Working together to organise such an inspirational event is testament to their dedication and passion for their subject. Ashik Jayakumar, Cathedral School Sixth Form student and STEM Society Chairperson, added: “During his presentation, Professor Winston highlighted the importance of collaboration. The STEM Night has shown us what can be achieved when you work together towards a common goal. “We initially set up the Cathedral School STEM Club, with the support of our teachers, to organise weekly activities and challenges for pupils in Years 7-9. Last year, we established the STEM Society with the aim of inspiring, supporting and encouraging a generation’s interest in these subjects.